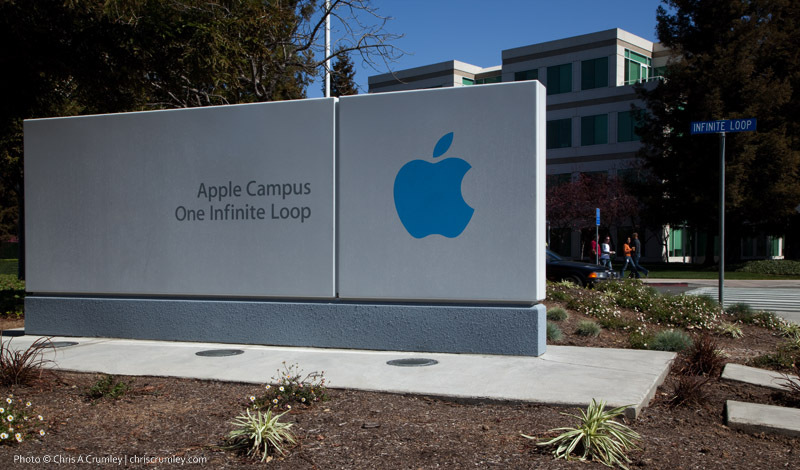 1 Infinite Loop is the Center of the Universe as many artists perceive it. Being an east coast guy with ten Macs, I had only read that 1 Infinite Loop and Cupertino, CA were the headquarters for Apple. Last Thursday, I found myself on Rt 17 going south from Napa-to-San Francisco-to-Monterey, CA, saw an exit to Cupertino and decided at 65mph to go see Apple. I had some spare time; why not? Off the highway and in Cupertino, it isn't hard to find Apple. Infinite Loop is comprised of six buildings on the inside of a circle about a large city block round. One building is for Executive Presentations, one houses The Company Store and the others are similarly tagged for a variety of company functions. But, the Loop buildings are only the beginning of the Apple presence. There are buildings-after-buildings with Apple logos in the surrounding techie-corporate-looking neighborhood. The Company Store had a few more demo stations, but it didn't offer a much different inventory than you'll find in a typical Apple store in Norfolk, VA or NYC. Well, maybe there were more Apple-logo soft goods; hats, shirts, jackets, pens and cups; that sort of thing. I asked to see a MacBook Pro 15 or 17" with max RAM, max space and rpm HD and a non-glare monitor, but they don't make a photographer's non-glare 15 yet and didn't have a 17. If they'd had it, I'd have walked away with it. I bought a couple of gifts for a fellow Apple user and got back on the highway. I hadn't seen Steve Jobs, but I have now seen the exterior of Apple and probably the Center of the Universe Corporate Headquarters. I'm not positive, but humor me and let's just say "I was there."